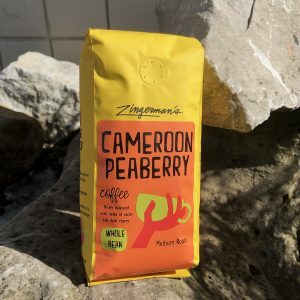 This particular Cameroon coffee is a peaberry—those wonderful genetic mutations that manifest as small, “single” coffee beans rather than the usual “split bean” we see 95 percent of the time. The coffee comes to us through a direct trade program that works hand-in-hand with farmers in the regions of Oku and Mbessa to provide training and technical assistance, especially in organic growing, and helps the farmers get their beans to market. It’s got a nice cocoa-iness, almondy, toasted sesame, almost like a bold tannic black tea. If you can’t decide between strong tea and a cup of coffee, this one might just really hit the spot! It’s savory and succulent, mouth-watering, maybe a bit magical! Really nice after dinner, especially after a bit of a spicy meal. It’s definitely an up-and-coming star in the coffee world. Emily McIntyre, writing in Fresh Cup,” advised us all to, “Mark Cameroon specialty coffee in your minds. You’ll be hearing a lot more about it in years to come.” This month’s offering is a chance to get out in front of the curve! I’ve been enjoying it daily since the first of the month! You may not be able to outrun your shadow but you can sure get over to the Coffee Company, Deli or Roadshow to grab a cup while supplies last! Excerpt from Ari’s weekly Top 5 E-Newsletter. To stay in-the-know about things that Ari is excited about in the Zingerman’s family, sign up here! 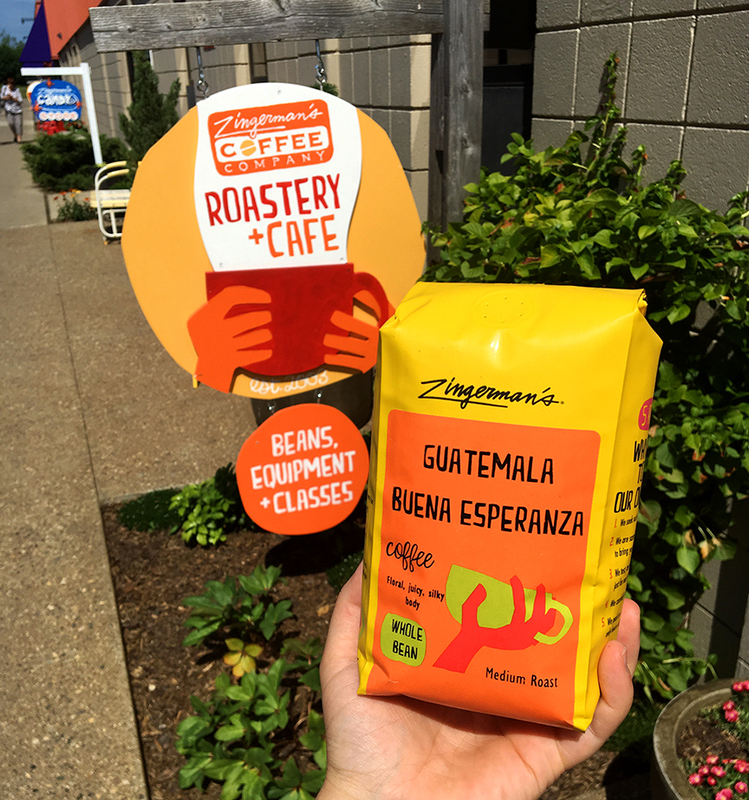 Zingerman’s has been working with Daterra Estate for 15 years since the inception of the Coffee Company. Our partnership with Daterra is a testament to what the term “relationship coffee” is all about. From our days as a micro-roaster in the corner of the Zingerman’s Mail Order warehouse back in 2003, and through the sizeable growth we have seen since, our partnership has grown as we have grown. The strength of the relationship starts on the farm’s cupping table. Every year, I trek down to the farm during the harvest season to select the varietals which make up our Espresso Blend #1 coffee. It’s quite the journey to get to the there which includes a connection in the states as well as 2-3 connections in Brazil culminating in a three hour car ride to the farm. From my front door to the gate of the farm, it’s about an 24-28 hour trip, daunting to any seasoned traveler. But, WOW, is it worth it! How I spend my time at the farm has often varied. In past years, part of my time was spent touring the farm (which, is actually split into 3 farms, and from there 300 “mini” farms). Nowadays, virtually all of my time is spent in the Daterra cupping lab, experimenting with different blends. It starts with tasting every coffee the farm has harvested (sometime up to 30 varietals) then narrowing down “finalist” coffees that I feel are either tasting superior this year or get us to our desired mark of producing a traditional northern Italian style espresso. I then prepare individual coffees as shots of espresso and play with different coffees to blend to the outcome we are looking for. 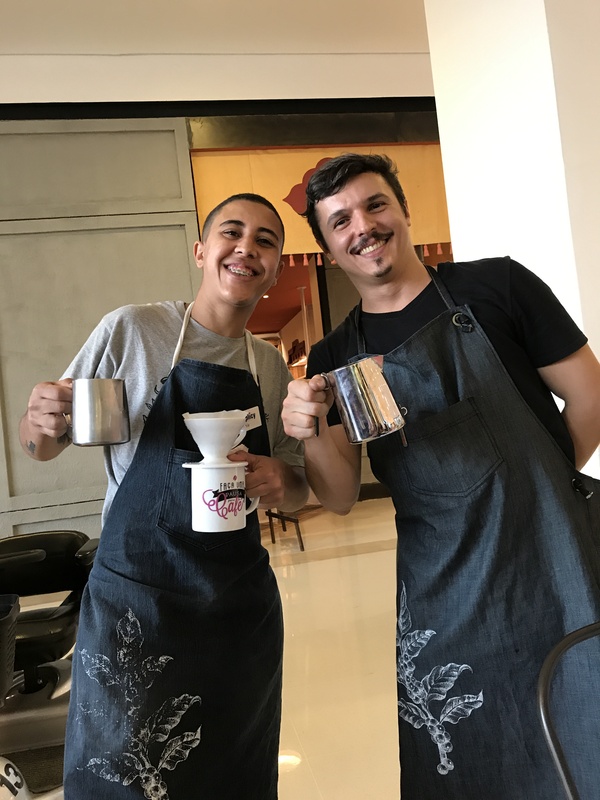 In Brazil, coffee primarily is an export – historically there was no real culture behind it, but a barista culture catching on there as we have it here in the States. Why go through all this year after year? Well, for one, it’s really fun. Though, more importantly the Espresso Blend #1 is an important coffee for us, as it makes up 30% of our coffee sales! It’s crucial that we taste (“cup”) the individual varietals every year, as each harvest brings distinctive, and sometimes surprising, flavors for us to consider – and it’s our goal to make sure that the blend has a consistent profile, year after year. The result? We aim for an espresso that is syrupy, sweet, velvety, full-bodied, and a little nutty. I’m more excited than I ever have been for this year’s blend, which will be comprised of 100 percent “natural” processed coffees, meaning the coffee cherries were dried whole, with the fruit still surrounding the bean. The blend hits our mark when brewed as an espresso, but it tastes exceptional as a brewed coffee, too. It has caramelly sweetness and notes of cocoa in the body. Overall the brew is smooth, balanced, and lingers on the palate. Next time you stop by the cafe, order an espresso (we serve ‘em with delicious & adorable espresso shortbread star cookies from our friends next door at the Zingerman’s Bakehouse!) and enjoy it as the Northern Italians do – standing at our bar-side table. For comparison, be sure to grab a bag of Espresso Blend #1 for home (we can grind the beans for you if you don’t have a coffee grinder at home). Let us know how you prefer it! Curious about Coffee? Sign up for our monthly e-newsletter to be the first to know about classes, events, new coffees, and more! A captivating coffee of the month! Ever since I started paying attention to, and appreciating, the flavors of regional beans, the nuances of various roast levels, the variations of crop years, and the other elements that make up an exceptional cup, Ethiopian coffees have kept their spot at the top of my personal taste list. Their remarkable, winy, at times blueberry-like, big flavors aren’t, I know, for everyone, but they’re definitely for me. I love ’em. This one’s been brightening my days since it hit the counters on the 1st of February. Having been to Ethiopia three and a half years ago, I see with even more certainty why the coffees are so special. Not only do they taste great, but they have a fantastic socio-cultural history as well. Ethiopia is the literal homeland of coffee. It’s where the coffee plant probably originated, and pretty surely where coffee was first consumed as a beverage. As the story goes, a young goat herder named Kaldi noticed his goats frolicking more than usual after eating the berries of a certain bush. He picked the berries and brought them to an Islamic monk who showed his disapproval by tossing them into the fire, from whence the first coffee roasting commenced. Somehow Kaldi decided to grind and brew the toasted beans and, apocryphally at least, coffee was born. Ethiopia is also the place from which Yemeni traders took coffee to Europe and the rest of the world. All of which is why coffee, quite simply, means about 88 times more in Ethiopia than it does anywhere else in the world. The traditional accompaniment for coffee in Ethiopia? Not a croissant, not vanilla syrup, not a cookie (though that Kifli would be an amazing accompaniment). It’s popcorn. That’s right. If you order coffee in a traditional setting, say after dinner, it will come with a bowl of popcorn. And while that may seem odd, I’ll tell you that it’s delicious. Sample some topped with one of the amazing spices from the folks at Épices de Cru alongside your next cup. This month’s roaster’s pick is a particularly lovely bunch of beans from the Yirgacheffe district. The town of Yirgacheffe is about 250 miles south and slightly west of Addis Abbaba—roughly an eight-hour drive on Ethiopian roads. It comes to us from Yirgacheffe Coffee Farmers’ Cooperative Union. It’s likely the home region to many of the first coffee trees, and the coffee does have a clarity and elegance that’s rather extraordinary. Carmelly and smooth with a bit of delicate cocoa-like deliciousness, and a slight, bright hint of citrus at the end. Everyone at the Coffee Company is talking about it. Barista Cholie Diaz loves it brewed in a Clever. I’ve been enjoying it as Pour-Over. Any way you brew it, it’s wonderful. Eligibility: This Campaign is open only to those who sign up at the http://zcob.me/nynbgiveaway and who are 18 years of age or older as of the date of entry. The Campaign is only open to legal residents of the United States, and is void where prohibited by law. Employees of Zingerman’s Community of Businesses, its affiliates, subsidiaries, advertising and promotion agencies, and suppliers, (collectively the “Employees”), and immediate family members and/or those living in the same household of Employees are not eligible to participate in the Campaign. The Campaign is subject to all applicable federal, state, and local laws and regulations. Void where prohibited. Agreement to Rules: By participating, the Contestant (“You”) agree to be fully unconditionally bound by these Rules, and You represent and warrant that You meet the eligibility requirements. In addition, You agree to accept the decisions of Zingerman’s Coffee Company as final and binding as it relates to the content of this Campaign. Campaign Period: Entries will be accepted online starting on Tuesday, January 1st, 2019, 12:00:01 EST and ending Thursday, February 28th, 2019, 11:59:59 EST. All online entries must be received by Thursday, February 28th, 2019, 11:59:59 EST. How to Enter: The Campaign must be entered by submitting an entry using the online form provided at http://zcob.me/nynbgiveaway. The entry must fulfill all Campaign requirements, as specified, to be eligible to win a prize. Entries that are incomplete or do not adhere to the rules or specifications may be disqualified at the sole discretion of Zingerman’s Coffee Company. You may enter only once. You must provide the information requested. You may not enter more times than indicated by using multiple email addresses, identities, or devices in an attempt to circumvent the rules. If You use fraudulent methods or otherwise attempt to circumvent the rules, your submission may be removed from eligibility at the sole discretion of Zingerman’s Coffee Company. – A 16 oz. bag of your favorite Zingerman’s Coffee beans and Zingerman’s Coffee Co. t-shirt, a $45 value. 10 winners! – Aeropress Coffee and Espresso Maker, a 16 oz. bag of your favorite Zingerman’s Coffee beans, and t-shirt. A $75 value. 3 winners! – GRAND PRIZE A Bonavita Coffee Maker, a 16 oz. 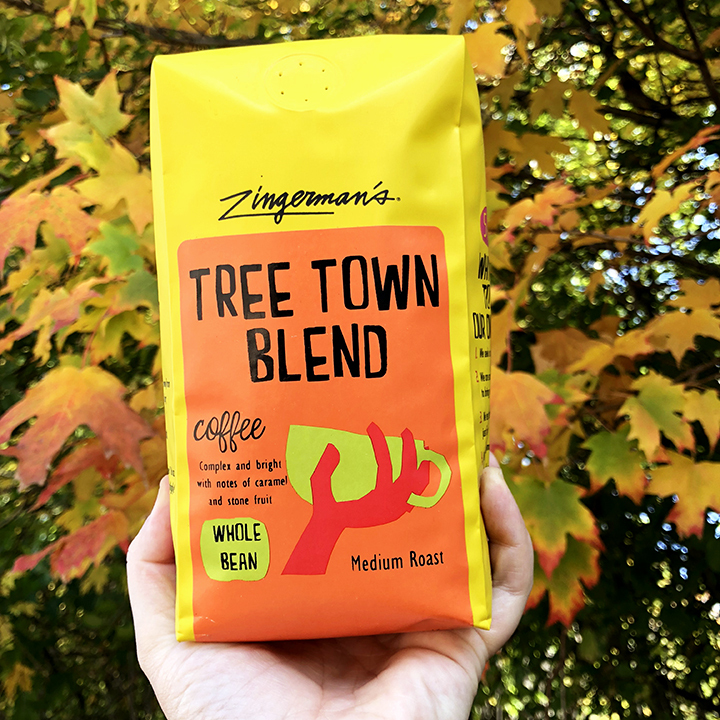 bag of your favorite Zingerman’s Coffee beans, and Zingerman’s Coffee Co. t-shirt. A $250 value awarded to one lucky winner! Actual/appraised value may differ at time of prize award. The specifics of the prize shall be solely determined by Zingerman’s Coffee Company. No cash or other prize substitution shall be permitted except at Zingerman’s Coffee Company discretion. The prize is non-transferable. Any and all prize-related expenses, including without limitation any and all federal, state, and/or local taxes, shall be the sole responsibility of Winner. No substitution of prize or transfer/assignment of prize to others or request for the cash equivalent by Winner is permitted. Acceptance of prize constitutes permission for Zingerman’s Coffee Company to use Winner’s name, likeness, and entry for purposes of advertising and trade without further compensation, unless prohibited by law. Winner Selection and Notification: Winner will be selected by a random drawing under the supervision of Zingerman’s Coffee Company. Winner will be notified by email within five (5) days following selection of Winner. Zingerman’s Coffee Company shall have no liability for Winner’s failure to receive notices due to spam, junk e-mail or other security settings or for Winner’s provision of incorrect or otherwise non-functioning contact information. If Winner cannot be contacted, is ineligible, fails to claim the prize within 30 days from the time award notification was sent, or fails to timely return a completed and executed declaration and release as required, the prize may be forfeited and an alternate Winner selected. Receipt by Winner of the prize offered in this Campaign is conditioned upon compliance with any and all federal, state, and local laws and regulations. ANY VIOLATION OF THESE OFFICIAL RULES BY WINNER (AT Zingerman’s Coffee Company‘s SOLE DISCRETION) WILL RESULT IN WINNER’S DISQUALIFICATION AS WINNER OF THE CAMPAIGN, AND ALL PRIVILEGES AS WINNER WILL BE IMMEDIATELY TERMINATED. Rights Granted by You: By entering this contest (e.g., photo, video, text, etc. ), You understand and agree that Zingerman’s Coffee Company, anyone acting on behalf of Zingerman’s Coffee Company, and Zingerman’s Coffee Company’s licensees, successors, and assigns, shall have the right, where permitted by law, to print, publish, broadcast, distribute, and use in any media now known or hereafter developed, in perpetuity and throughout the World, without limitation, your entry, name, portrait, picture, voice, likeness, image, statements about the Campaign, and biographical information for news, publicity, information, trade, advertising, public relations, and promotional purposes without any further compensation, notice, review, or consent. Optional verbiage for Contests: By entering this content, You represent and warrant that your entry is an original work of authorship, and does not violate any third party’s proprietary or intellectual property rights. If your entry infringes upon the intellectual property right of another, You will be disqualified at the sole discretion of Zingerman’s Coffee Company. If the content of your entry is claimed to constitute infringement of any proprietary or intellectual proprietary rights of any third party, You shall, at your sole expense, defend or settle against such claims. You shall indemnify, defend, and hold harmless Zingerman’s Coffee Company from and against any suit, proceeding, claims, liability, loss, damage, costs or expense, which Zingerman’s Coffee Company may incur, suffer, or be required to pay arising out of such infringement or suspected infringement of any third party’s right. Terms & Conditions: Zingerman’s Coffee Company reserves the right, in its sole discretion, to cancel, terminate, modify or suspend the Campaign should virus, bug, non-authorized human intervention, fraud, or other cause beyond Zingerman’s Coffee Company’ control corrupt or affect the administration, security, fairness, or proper conduct of the Campaign. In such case, Zingerman’s Coffee Company may select the Winner from all eligible entries received prior to and/or after (if appropriate) the action taken by Zingerman’s Coffee Company. Zingerman’s Coffee Company reserves the right, in its sole discretion, to disqualify any individual who tampers or attempts to tamper with the entry process or the operation of the Campaign or website or violates these Terms & Conditions. Zingerman’s Coffee Company has the right, in its sole discretion, to maintain the integrity of the Campaign, to void votes for any reason, including, but not limited to: multiple entries from the same user from different IP addresses; multiple entries from the same computer in excess of that allowed by Campaign rules; or the use of bots, macros, scripts, or other technical means for entering. Any attempt by an entrant to deliberately damage any website or undermine the legitimate operation of the Campaign may be a violation of criminal and civil laws. Should such attempt be made, Zingerman’s Coffee Company reserves the right to seek damages to the fullest extent permitted by law. Limitation of Liability: By entering, You agree to release and hold harmless Zingerman’s Coffee Company and its subsidiaries, affiliates, advertising and promotion agencies, partners, representatives, agents, successors, assigns, employees, officers, and directors from any liability, illness, injury, death, loss, litigation, claim, or damage that may occur, directly or indirectly, whether caused by negligence or not, from: (i) such entrant’s participation in the Campaign and/or his/her acceptance, possession, use, or misuse of any prize or any portion thereof; (ii) technical failures of any kind, including but not limited to the malfunction of any computer, cable, network, hardware, or software, or other mechanical equipment; (iii) the unavailability or inaccessibility of any transmissions, telephone, or Internet service; (iv) unauthorized human intervention in any part of the entry process or the Promotion; (v) electronic or human error in the administration of the Promotion or the processing of entries. Disputes: THIS Campaign IS GOVERNED BY THE LAWS OF THE UNITED STATES AND THE STATE OF MICHIGAN, WITHOUT RESPECT TO CONFLICT OF LAW DOCTRINES. As a condition of participating in this Campaign, participant agrees that any and all disputes that cannot be resolved between the parties, and causes of action arising out of or connected with this Campaign, shall be resolved individually, without resort to any form of class action, exclusively before a court located in Michigan having jurisdiction. Further, in any such dispute, under no circumstances shall participant be permitted to obtain awards for, and hereby waives all rights to, punitive, incidental, or consequential damages, including reasonable attorney’s fees, other than participant’s actual out-of-pocket expenses (i.e. costs associated with entering this Campaign). Participant further waives all rights to have damages multiplied or increased. Winners List: To obtain a copy of the Winner’s name or a copy of these Official Rules, mail your request along with a stamped, self-addressed envelope to: Zingerman’s Community of Businesses, 3756 Plaza Dr., Ann Arbor, MI 48108 USA. Requests must be received no later than December 31st, 11:59:59 PM EST. Sponsor: The Sponsor of the Campaign is Zingerman’s Coffee Company, 3723 Plaza Drive, Ann Arbor, MI 48108. Facebook: The Campaign hosted by Zingerman’s Coffee Company is in no way sponsored, endorsed, administered by, or associated with Facebook. Twitter: The Campaign hosted by Zingerman’s Coffee Company is in no way sponsored, endorsed, administered by, or associated with Twitter. Instagram: The Campaign hosted by Zingerman’s Coffee Company is in no way sponsored, endorsed, administered by, or associated with Instagram. By entering this contest here, You, the Contestant, have affirmatively reviewed, accepted, and agreed to all of the Official Rules. 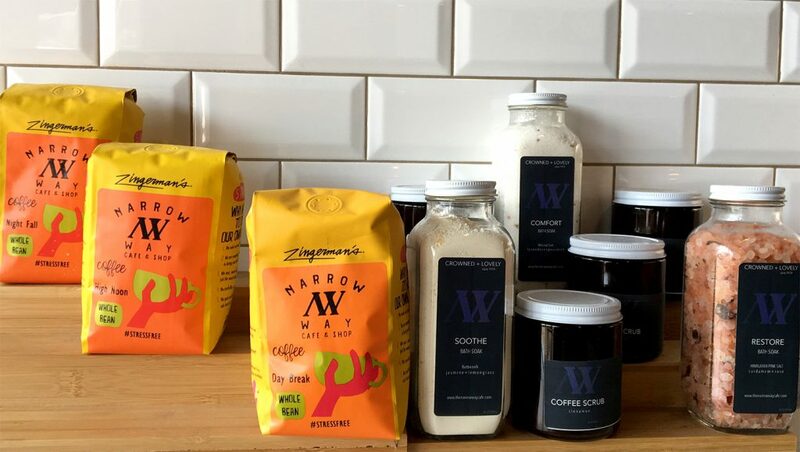 You also agree to Zingerman’s Community of Business using your likeness to promote this contest and sale of Zingerman’s Coffee Company products. One-year anniversary of serving those super special toast combos at the Coffee Company! 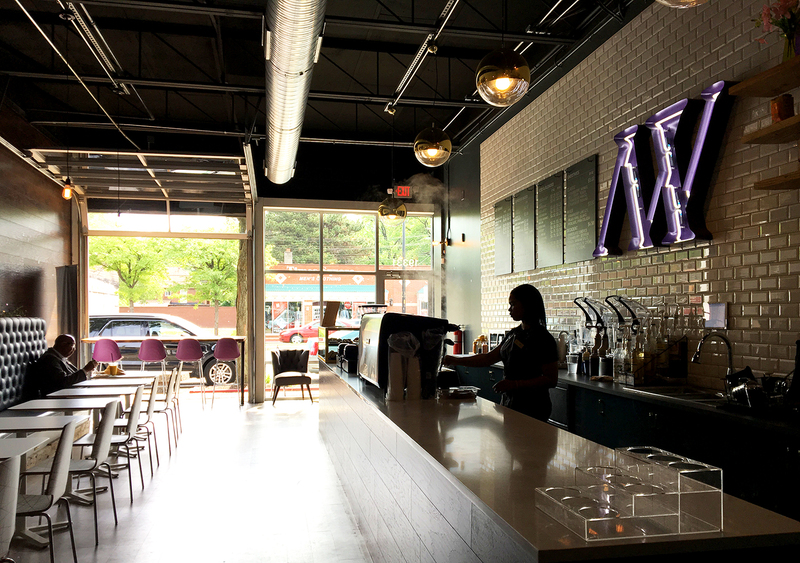 This week we’re celebrating the one-year anniversary of serving toast at the Coffee Company! Since I’m sitting in the coffee shop right now as I write, watching wonderful orders of incredible plates of toast delivered to customers’ tables…it’s hard to resist sticking in a toast to toast here! So toast, here’s to you! Happy Anniversary! And here’s to much more great toasting to come! The Michelle Ma’Belle toast still makes me smile every time I have a bite. A nice substantial slice of the Bakehouse’s Country Miche warm toast topped off with a generous spreading of the Creamery’s handmade artisan Cream Cheese and a healthy grinding of that same incredibly aromatic Tellicherry Pepper #10 that comes in from Kerala in southwest India. We finish it off with a drizzle of extra virgin olive oil on the plate that you dredge the toast through before you take a bite. It all comes together to be one darned terrific piece of toast. I could eat this stuff every day! 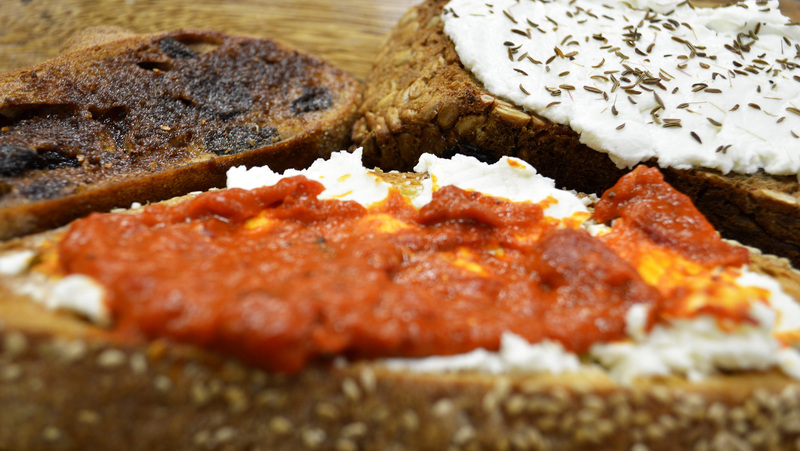 But then there’s more…the Bulgarian toast has been the smash surprise hit—Sicilian Sesame Semolina toasted and topped with fresh goat cheese from the Creamery and Bulgarian lutenitsa (you may never have heard of it but it’s highly likely you’ll love it: a spread of peppers, eggplant and tomatoes!). Or the Portuguese toast—cinnamon raisin bread topped with extra virgin olive oil and cinnamon sugar. Or the Caviar of the South—pimento cheese on toasted Roadhouse bread! Or the English toast with cream cheese and cucumbers! Or the alliteratively and culinarily catchy Teutonic toast—the Bakehouse’s Dinklebrot (spelt bread) with cream cheese and wild Uzbek black cumin. And last, but not least, Lauren’s Sweet Heat—goat cream cheese, coffee blossom honey, and Korean red chile flakes on toasted Roadhouse bread! Makes me hungry just writing about them. Come by anytime—all these toasts are terrific for breakfast, lunch, snacks, or even an early evening meal (we’re open ’til 7). 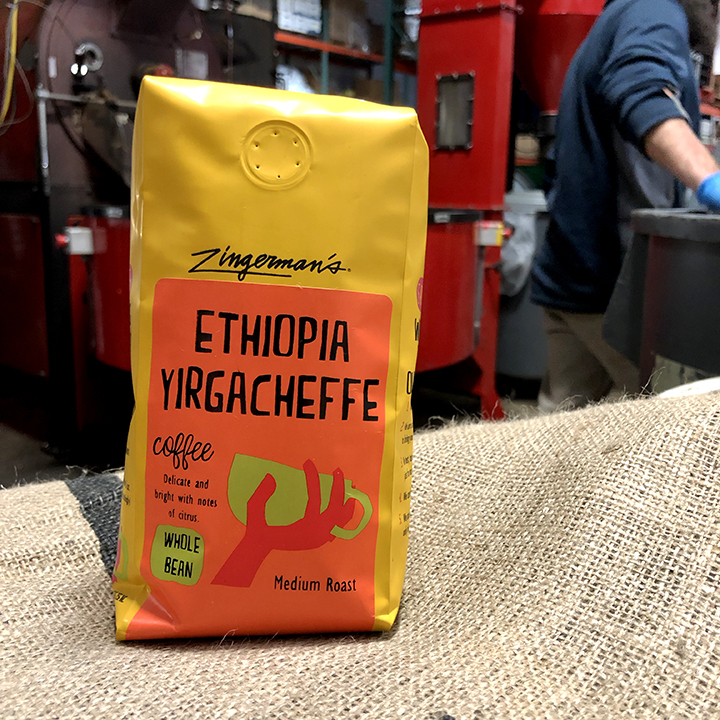 Zingerman’s has been working with Daterra Estate for about 15 years, since our days as a roaster in the corner of the Zingerman’s Mail Order warehouse back in 2003. Over the years, we’ve built a strong relationship that starts on the farm’s cupping table. 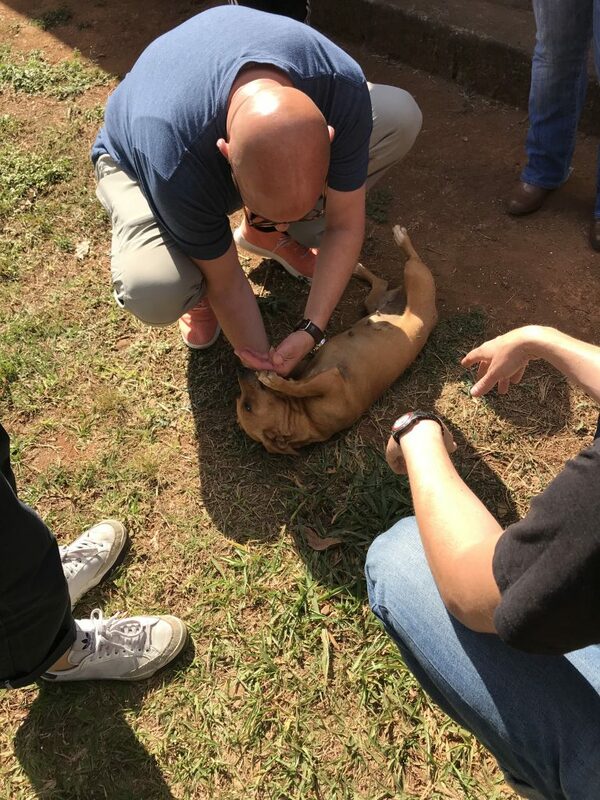 Every year, I trek down to visit our friends and coffee producers at Daterra Estate in Brazil, during the harvest season. The purpose of my visit is always two-fold: to taste (or, as we call it in the industry, “cup”) and select the varietals which make up our Espresso Blend #1 coffee (I’ll explain this process in a separate post – stay tuned!) to get an update on our experimental coffee plot. It’s quite the journey to get to the farm. I always fly into São Paulo, Brazil’s most populous city, and from there, catch another flight inland to the municipality of Uberlândia in the state of Minas Gerais. From the airport in Uberlândia, it’s a three-hour car ride through the Cerrado — a vast, lush, savanna ecoregion—to the Daterra farm. From my front door to the gate of the farm, it’s about an 24-hour trip, but, WOW, is it worth it! “Entry Prohibited”. There is a plot in TB13 tabois designated to us. Daterra Estate is owned by the Pasqual family. Patriarch Louis Pasqual comes from a family that started in auto parts and tire service centers in Brazil and became the largest tire distributor in the country. As a result of that success, the Pasquals created a foundation from which they were able to give back to the country that gave them so much. They tried a few ventures—first with milk, then fruits and cattle—until they settled on coffee. At the time, there was an opportunity to bring specialty coffee to Brazil. The Pasquals allowed the farm to grow and flourish for 10 years before selling a single cherry! They truly wanted to develop something great, and invested in building up a quality farm before getting started commercially. Today, Brazil is the largest exporter of coffee in the world, and Daterra is the 3rd largest farm in the entire country. 3 years ago, this pup just appeared onto the farm and took to me and has always been a highlight of my trips when i come each year. Her name is Joaquim. I tried to figure out a way to bring her here to States! 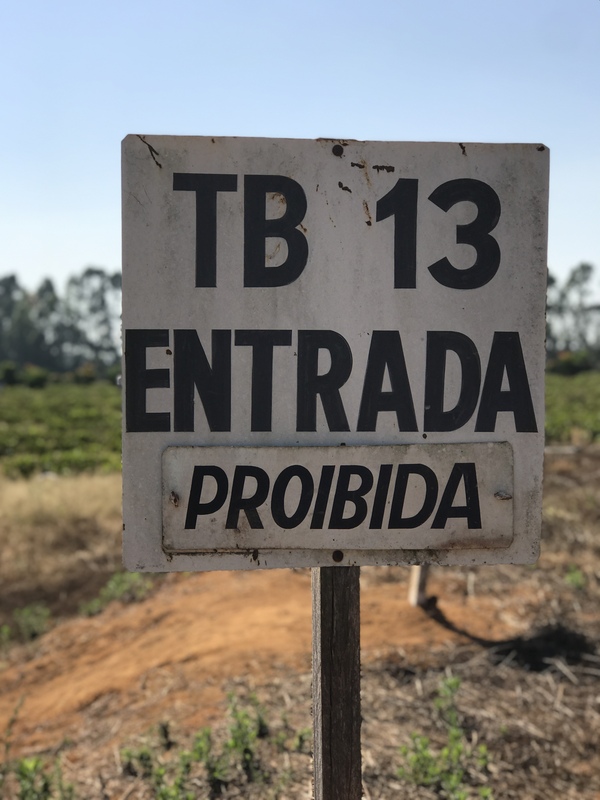 Given the scope of Daterra’s operation, the fact that they received the Rainforest Alliance’s first EVER Level-A certification for their sustainability practices is profoundly impressive. What does that look like, exactly? Well, 60% of the farm is uncultivated, meaning the natural ecosystem of the area can thrive. 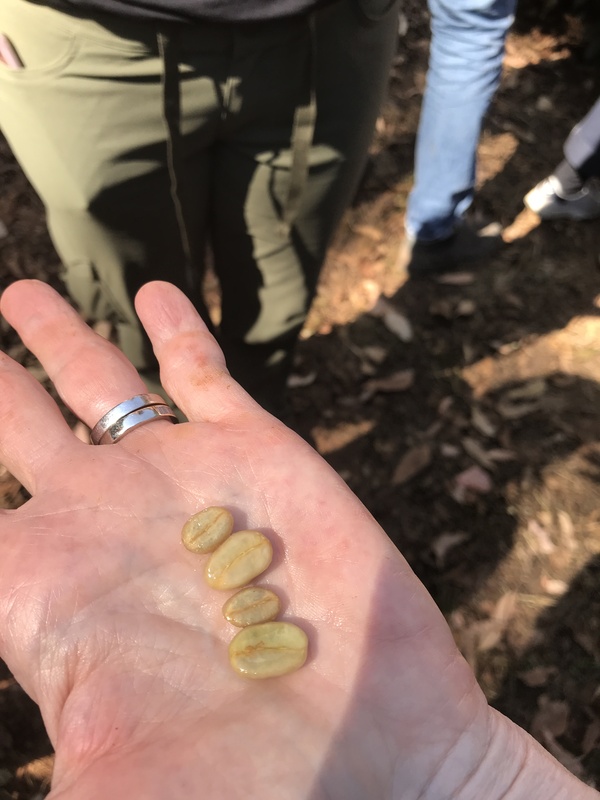 Also, Daterra has embarked upon research into biological activity in soils used for coffee cultivation in partnership with the University of Sao Paolo. The program, called “Bioterra”, tracks a particular enzyme shown to be a good marker of biological activity and abundance of bacteria and fungi in soil. Another initiative of the Bioterra program is intercropping of coffee lines, to promote microbial diversity in the soil. 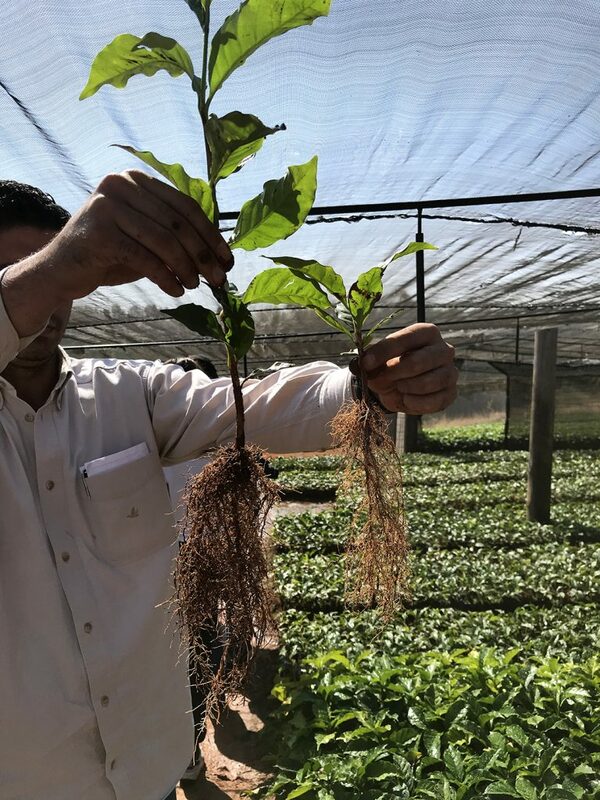 Daterra is on the cutting edge of sustainability, agronomy, and business models, and we are beyond proud to be one of their highest-level partners. Root structure of seedlings in the nursery. During the period of time it is growing, caretakers do some pruning. The root structure of the seedling actually modifies to the pruning! Old roots fall away and new ones grow to give energy to areas of seedlings that are above the earth. Our exciting project with Daterra Estate is cultivating the Pacamara varietal (if you’re not familiar with it, I found a great write-up here). I was struck by the immense size of the Pacamara bean during my first ever origin trip to El Salvador many years ago, and I knew I had to do something special with this varietal. Pacamara has not traditionally been grown in Brazil. Our 3-acre plot is on a high, flat plane in the Cerrado region of Brazil near the city of Patrocínio. It is amongst the best coffee producing areas in the country. We made a commitment to the farm with the plot project we’re a part of and we go down at least once a year to check on the status of the program. This is the longest term project that the farm has ever embarked upon. This project is several years in the making and, if our plot turns out to be sustainable, it could go on for 20 years! Pacamara beans in comparison to a more common varietal – the Pacamara is quite a bit larger. We have an odd varietal planted in a foreign country, and it will take longer to develop. We have an experiment within an experiment happening as well: half of the project is shade grown, the other half is indirect sunlight. At processing level, we’d like to have some of this coffee as natural, some as a pulp natural, and some washed and fermented. Probably honey as well! We’re not expecting a lot of fruit this year, but next year should be a different story. Daterra’s agronomist really likes the healthy & robust development of our seeds, optimistic about fruit our trees will produce. Flowering of the trees in September will be our next milestone marker to know what to expect in terms of cherry production. Pacamara coffee has been described as creamy in texture with intense aroma, with a wide range of flavors that fall under ‘sweet’ or ‘fruity’ descriptors. It’s a unique cup of coffee for sure. Daterra Estate may be the world’s most technologically advanced coffee grower. They pioneered the Penta(tm) System that ensures quality from the plants in the nursery to the shipping of the coffee beans. Our Brazilian coffees benefit from all of Daterra’s innovations including a 7-step sorting process which uses 2 different laser sorters. The finished coffee is then stored in perfectly climate controlled wooden silos and shipped to us monthly throughout the year for consistent quality year round. Daterra’s attention to detail also extends to their care for people and the land. Their name means “from the earth”. Daterra has been preserving and restoring native forests, wildlife and waterfalls resulting in 50% of their land being designated Natural Preservation Areas. They also lean the industry with their on-site school for workers’ children and are highly sought in the area as the employer of choice. We are proud of our work with Daterra Estate and are excited to taste the fruits of their innovation and experimentation with you in the future – stay tuned! A beautiful brew that can turn any day into a holiday! If you’re thinking about what to drink when you dive into a nice bite of pecan pie, this seasonal brew from the Coffee Company could just be the trick. We’ve been doing an annual Holiday Blend for over a decade now, but I’m pretty sure that the 2018 vintage is the best one yet! In Zingerman’s Guide to Good Leading, Part 3, in secret #37, “A Lapsed Anarchist’s Approach to Time Management,” I shared my sensibilities about time. One of the keys to my approach, developed over many years of making mistakes and trying to learn from them, is that I really try to approach every day as if it’s a holiday. This coffee—at least for the next few months—is helping me make that a reality. I’ve been drinking it daily since the Coffee Company debuted it earlier this month, and I plan to keep pouring it straight through ‘til they stop at the end of December. Even with Thanksgiving, Chanukah, Christmas, Kwanza, and any other celebrations coming up in the next few months, the reality is that the majority of days remain…technically just another day in the calendar. This compelling coffee gives you—and me—the chance to make each one of them just a bit more marvelous! 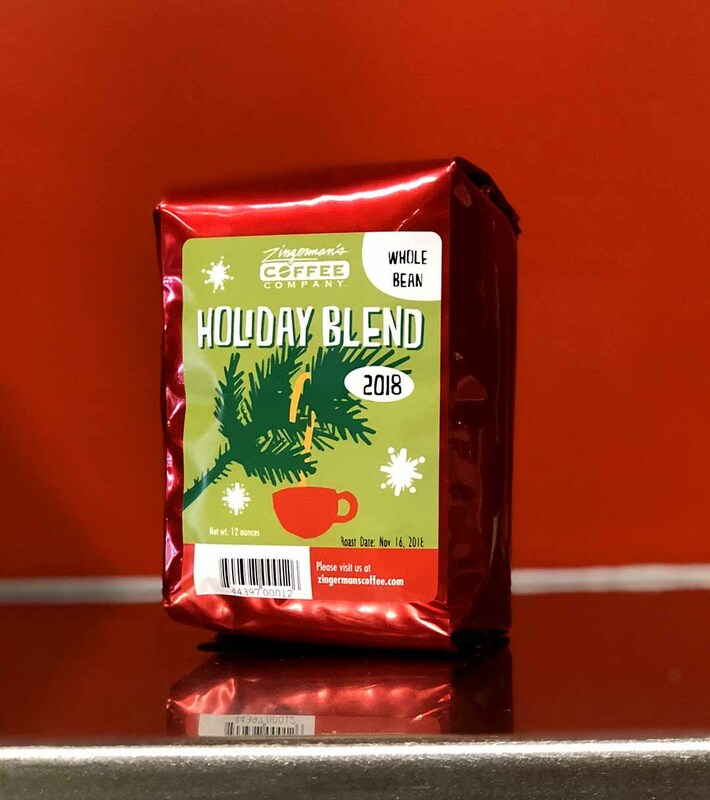 “When we developed this year’s Holiday Blend, we started with our favorite estate coffees from Costa Rica and Brazil. For complexity and balance, we added a bit of cooperative-grown coffee from Colombia. The resulting blend is rich, layered, and smooth with hints of cocoa. We’ve been working with Brazil’s Daterra Estate since our early days. Over 10 years later, Daterra Estate is still producing some of the finest coffees we have ever tasted. The mix of natural and pulped-natural beans from Daterra that make up the base of this blend give it a smooth, velvety body with a nice cocoa-like quality. The Costa Rica component, which adds natural sweetness and a caramel-like note, comes from our friends at Hacienda Miramonte. Started in 1917 by the matriarch of the Gurdian family, Lucila Duval de Morales, the farm is now operated by her great-grandson Ricardo. To my point about making every day a holiday, Matthew closed out with this: “We think the Holiday Blend is the kind of coffee you can drink day or night, at breakfast or with dessert, indoors, outdoors, with family and friends, or just by itself, as you sit fireside wrapped in a blanket. You and your coffee, comfort and joy.” Beautiful with babka from the Bakehouse, perfect when you pair it with that pecan pie, or after a bowl of the Creamery’s terrific Cardamom gelato(more on that soon—seriously check it out!). October’s “Coffee of the Month” just might make your day! I have to admit that I’m generally biased against coffee blends. More typically, I prefer to taste one origin at a time, so I can backtrack to where it came from and understand what the growers and producers are doing. But, this new Tree Town Blend from the Coffee Co. took me by surprise. I love it. I’ve been drinking it pretty much daily this month and, other than when I go out of town, I’m pretty sure I’ll be drinking it every day for the rest of the month as well. Why “Tree Town?” Because, of course, trees are embedded in the name of our town. Founded nearly 200 years ago, in 1824, the original spelling was Annarbour—it was named for the wives of the founders who were both named Ann and the Bur oak groves which were so prominent in the area (and a good reason why it’s right for us to smoke over oak wood logs at the Roadhouse). Aside from the fact that it tastes so good, the blend does seem sort of perfect for Ann Arbor. Like the town, it’s made up of interesting components that come from the far corners of the earth that are blended by local culture and expertise to make something really special. I was actually having a hard time remembering the five origins in the blend so Erin Dion from the Coffee Company came up with a clever mnemonic device nice phrase to help me embed it in my mind: “Tree Town Coffee Means Killer Beans”. Fetco (those are the bigger, bulk, brewing machines) — Really fine. Shockingly smooth for this brewing method. Well-rounded. Dark toasted sesame. Pour over — Lighter, cocoa, toast. I’m hoping for a nice fall day where I can sit under a big, beautiful, old tree, and reflect a bit on where I get to live, and appreciate all the Ojibwe people who lived on this land for so many centuries, and then the men and women who formally founded the modern version of this very special town of which I feel so fortunate to be a part. 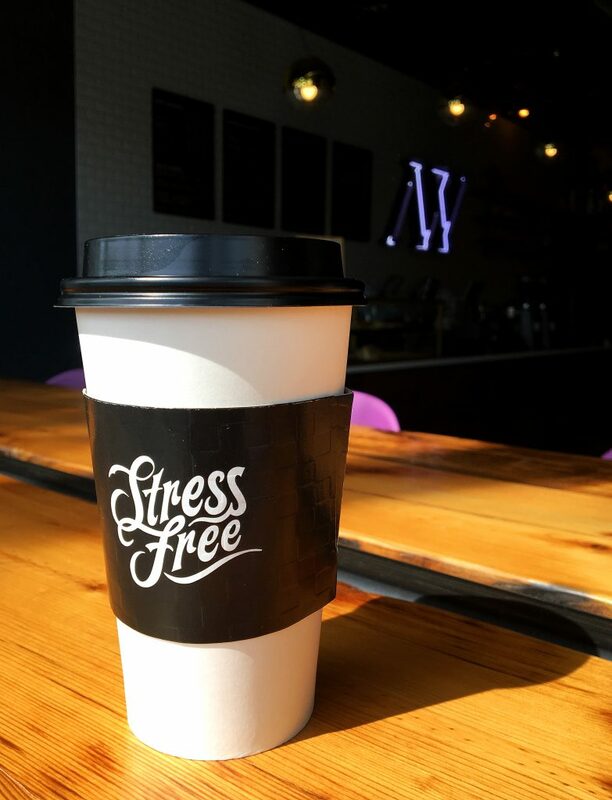 Drink Coffee the Stress Free Way at Narrow Way Café! It’s a hot summer morning, and I’m driving into Detroit. My A/C is lukewarm at best, so my windows are down, and my hair is whipping onto my face. It’s my first time driving to the Avenue of Fashion, and to Narrow Way cafe. You know how it is – even if you’re looking forward to the destination, sometimes the journey is frazzling. Finding parking, making sure you’re getting there on time, defensive driving. I’m stepping on the skirt that’s too long for my 5’2” stature, quickening my steps to make sure I get there on time. As soon as I walked through the door of the Narrow Way (a cafe we provide roasted coffee beans to), it felt like I closed my eyes and sank into a bath. My shoulders dropped, and I felt like I exhaled for the first time that morning. I was greeted with calm, friendly smiles from the baristas. The first thing that caught my eye was a light wood bar that opened onto the sidewalk, with seating on either side. This is made possible with a garage door that opens up and tucks away. It creates this balance in the cafe of natural lighting, with soft dim lighting further inside. Soft music was playing at the perfect volume to add to the ambiance, but not loud enough to take over a conversation. Sabrina, the General Manager and Partner at Narrow Way cafe, greets me with a warm hello. We take a seat at the en plein air bar. A barista brings me my coffee order – the sleek minimalist cups say “Stress Free”. I laugh and tell Sabrina that my morning stress really did dissipate as soon as I stepped through the doors, and I’m eager to learn more about their approach! 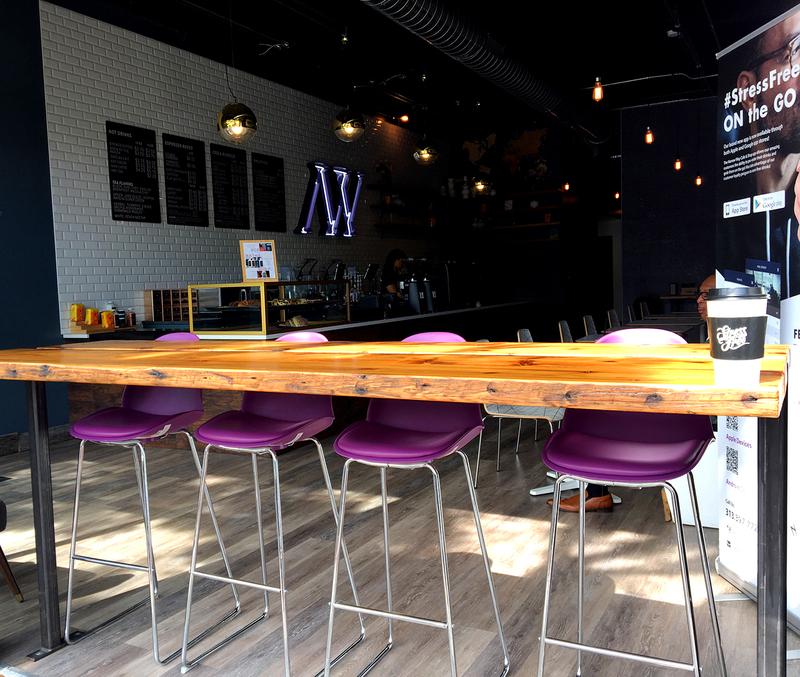 Zingerman’s Coffee: You say that you offer a “stress-free” environment. How do you and your team curate this experience for your guests? ZC: Tell me a bit about the Cafe’s neighborhood. What do you see happening that you’re excited about? 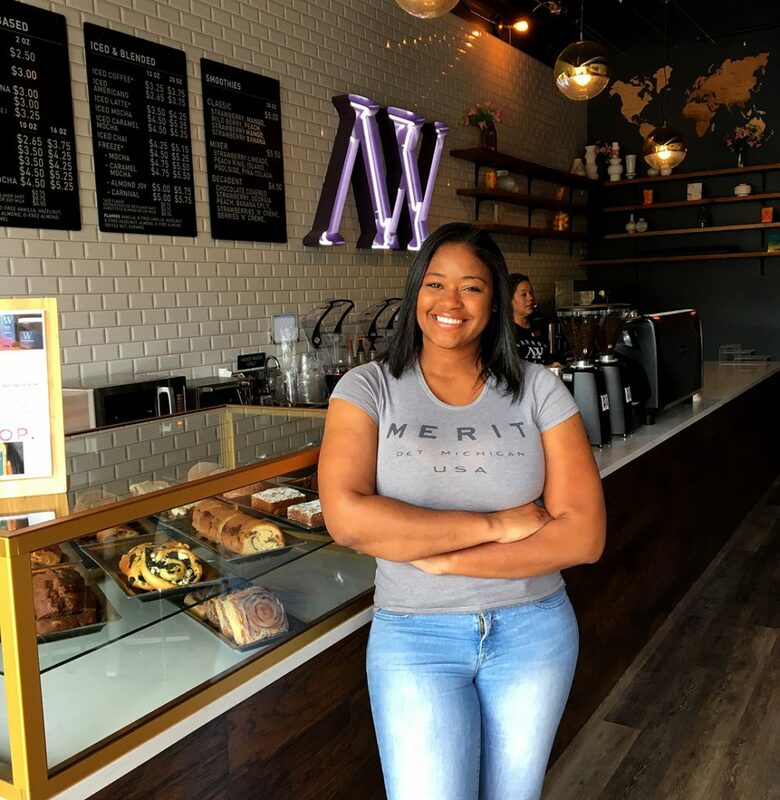 “Our cafe started in a church, and it was really about serving and sharing love at that point. What better way to do that then extend it beyond the congregation? We noticed that this area didn’t have small, privately owned coffee shop. The community reception, even before we started and then during buildout, was amazing. People in community as well as local business owners have supported us; neighborhood councils have reached out to have us join. The attraction and enthusiasm seems mutual! We wanted to provide a place where people can see their neighbors and familiar faces, and we see that every day! Customers who we didn’t know knew each other! We had regulars within the first week. ZC: How did the decision to work with the Zingerman’s Coffee Company align with your business perspective? S: Working with Zingerman’s was our greatest idea – it has been such a help and benefit. The relationship we have with Zingerman’s is key! Not only great product, but the mentorship, too. We see great values in product, customer service, and how Zingerman’s does business. We look at that and love, appreciate, and aspire to incorporate it into our own business. It’s absolutely key in so many ways. We love the Zingerman’s Coffee Company! We have great partnerships with Steve, Matthew, Chris – they are a wealth of knowledge. Diane was amazing and still is! Even when Diane transitioned out of her role, you know, you worry about who you’re going to work with next…but Laura is amazing! Zingerman’s is always conscientious of the realities of being a small business, and willing to help a lending hand. It’s been a great resource. 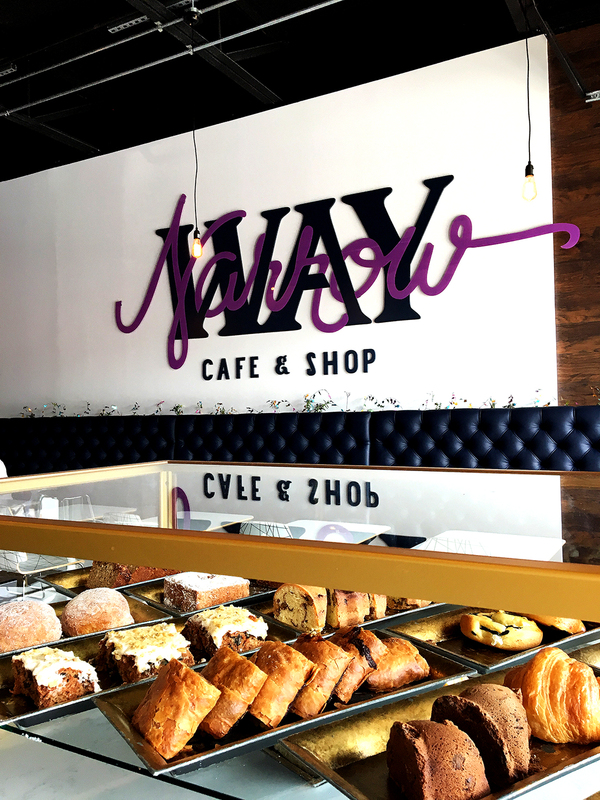 ZC: What does success and progress for the Narrow Way Cafe look like? S: Do we want to expand? Absolutely! Can’t pinpoint when that would be. We want other Narrow Ways. Within the city of Detroit. We want to not only serve more people, but provide more things. We have grown from providing to baked goods to sandwiches as well. We have gotten into catering! It came out of nowhere. We get calls and requests for things that we don’t do yet, but we will certainly consider down the road. We try to accommodate as best we can! We even had a birthday party here for a little girl with smoothies and baked goods. Jeffrey and I both agreed that we would not be strangers at Narrow Way. Back in the ‘60s, Scott McKenzie sang the famous song: “If you’re going to San Francisco, Be sure to wear some flowers in your hair; If you’re going to San Francisco, You’re gonna meet some gentle people there.” He was talking about San Francisco, California of course. But he could have written it about San Francisco, the small town in northwest Guatemala, not far from the farm where this fabulous Buena Esperanza coffee is grown. The gentle spirit of the song, the focus on beauty and love, care and compassion, all come together in this very compelling micro-lot coffee that’s just arrived. Pretty much every staffer at the Coffee Company is all abuzz about it. And, now, I am as well. I’m betting you will be, too! The coffee comes to us from a woman I’ve yet to meet, Noe Castillo. The beans are grown on her family’s small, 16-acre farm. It’s up in the remote mountains of northwest Guatemala.The region is one of the most diverse in the country, with a strong presence of Maya people—there are seven different Mayan dialects spoken in the area. Noe’s mother worked on the farm for 40 years; now her brothers all work there. The family clearly has a great work ethic and a commitment to quality. Because, with all due respect to Steve, Chris, Asa and everyone who roasts at the Coffee Company, not even an alchemist could turn only average raw material into an amazing coffee like this. Grown under shade trees at about 1900 meters (altitude contributes to complexity of flavor), the beans are “washed” to remove the pulp, which enhances some of its soft mellowness. I’ve heard flavor descriptors for Buena Esperanza like sweet iced tea, green grapes, brown sugar, brown butter, honeydew melon, golden currants, and raisins. It’s definitely juicy, silky soft, floral…This flavor is this one is almost the opposite of the Domenica Fiore olive oil. Whereas the latter has edge and gets right up—elegantly, I should say—in your face, the Guatemala Buena Esperanza is a gentle, soft, sensuous, subtle set of flavors that remind me of freshly made cinnamon toast. A cup of the Buena Esperanza—I like it brewed as a pour over—would make a wonderful accompaniment to one of those Toni rolls from the Bakehouse (sourdough, studded with chunks of dark chocolate). Buena Esperanza means “good hope.” It’s well named. Both for the quality of the growing, the roasting, and care that the Castillo family commit. It’s a sign of positive hope for a healthy, collaborative, ecologically sound future. As anarchist Peter Kropotkin once said, “it is always hope…which makes revolutions.” Here’s to calm, caring, collaborative times to come.